This is my entry into the Sugar Bowl challenge this week. I just purchased Stardust this past week, and had to ink her up right away. I must say that Funky Kits has the best shipping ever! It only took 5 days for my stamps to arrive here......compared to almost 2-3 weeks from the US! Isn't that amazing! You rock, Funky Kits. Since the theme is ice and snow, I decided to go with a blue theme. I used a variety of BG and B markers from copic to color the image. 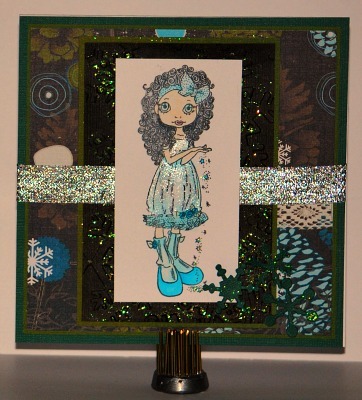 I used the cuttlebug snowflake folder and embossed the dark green paper behind the image. I then spread Diamond Stickles all over this to give it some shimmer. I did the same to the snowflakes I die cut. I also added the same stickles to the stars. I'm having a hard time getting a good picture of this card so I'll try in different light later on. My apologies for that. Really cute image, lots of detail to make her shine. This is a really cute image and the details set off the card beautifully- thanks for joining us at the Friday Mashup! Lovely coloring and lots of fun sparkles! Thanks so much for joining The Friday Mashup this week. I love the shine on this card! You definitely got the ice part down! Sweet image and card! Love the sparkly trim!